Appropriate control of the source of infection is of outmost importance in the management of surgical infections. Intra-abdominal infections along with soft tissues infections are the sites where a source control is more feasible and more impactful. In these settings an appropriate source control can improve patients’ outcome and reduce antibiotic pressure allowing short course of antibiotic therapy. 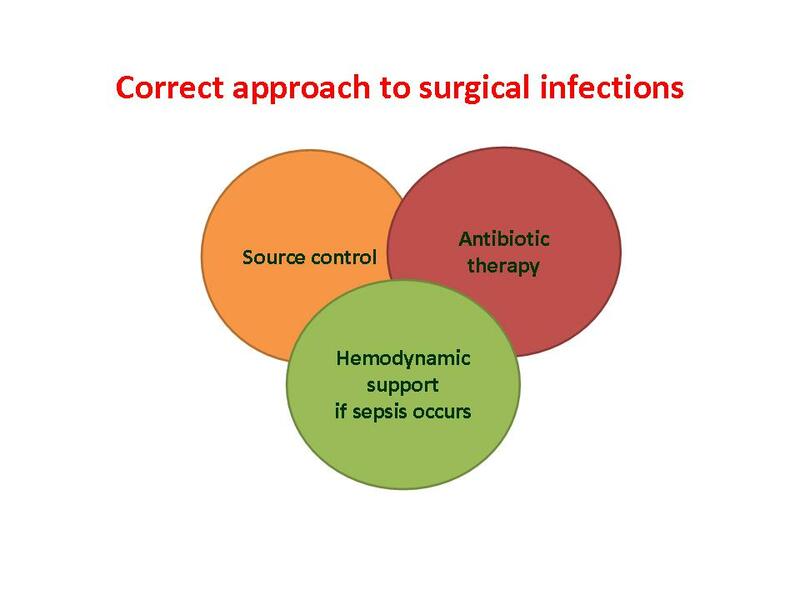 A correct approach to surgical infections should always include adequate control of the source of infection, appropriate antibiotic therapy and prompt hemodynamic support when sepsis occurs. Source control encompasses all measures undertaken to eliminate the source of infection, reduce the bacterial inoculum and correct or control anatomic derangements to restore normal physiologic function. In critically ill patients with severe sepsis these principles can be applied at different times in the same patient. Appropriate source control are of outmost importance in the management of surgical infections. Intra-abdominal infections along with soft tissues infections are the sites where a source control is more feasible and more impactful. In these settings an appropriate source control can improve patients’ outcome and reduce antibiotic pressure allowing short course of antibiotic therapy. Source control generally involves drainage of abscesses or infected fluid collections, debridement of necrotic or infected tissues and definitive control of the source of contamination. Early control of the septic source can be achieved using both operative and non-operative techniques. An operative intervention remains the most viable therapeutic strategy for managing surgical infections in critical ill patients. As a general principle, every verified source of infection should be controlled as soon as possible. The level of urgency of treatment is determined by the affected organ(s), the relative speed at which clinical symptoms progress and worsen, and the underlying physiological stability of the patient. Non-operative interventional procedures include percutaneous drainages of abscesses. Ultrasound and CT guided percutaneous drainage of abdominal and extraperitoneal abscesses in selected patients are safe and effective. The principal cause for failure of percutaneous drainage is misdiagnosis of the magnitude, extent, complexity, location of the abscess. Surgery is the most important therapeutic measure to control surgical infections. In the setting of intra-abdominal infections the primary objectives of surgical intervention include a) determining the cause of peritonitis, b) draining fluid collections, c) controlling the origin of the abdominal sepsis. In patients with intra-abdominal infections, surgical source control entails resection or suture of a diseased or perforated viscus (e.g. diverticular perforation, gastroduodenal perforation), removal of the infected organ (e.g. appendix, gallbladder), debridement of necrotic tissue, resection of ischemic bowel and repair/resection of traumatic perforations with primary anastomosis or exteriorization of the bowel. Intra-abdominal lavage is a matter of ongoing controversy. Some authors have favoured peritoneal lavage because it helps in removal as well as in dilution of peritoneal contamination by irrigation with great volumes of saline. However, its application with or without antibiotics in abdominal sepsis is largely unsubstantiated in the literature. In certain circumstances, infection not completely controlled may trigger an excessive immune response and local infection may progressively evolve into sepsis, septic shock, and organ failure. Such patients can benefit from immediate and aggressive surgical re-operations with subsequent re-laparotomy strategies, to curb the spread of organ dysfunctions caused by ongoing peritonitis. Surgical strategies following an initial emergency laparotomy include subsequent “re-laparotomy on demand” (when required by the patient’s clinical condition) as well as planned re-laparotomy in the 36-48-hour post-operative period. On-demand laparotomy should be performed only when absolutely necessary and only for those patients who would clearly benefit from additional surgery. Planned relaparotomies, on the other hand, are performed every 36–48 hours for purposes of inspection, drainage, and peritoneal lavage of the abdominal cavity. The concept of a planned relaparotomy for severe peritonitis has been debated for over thirty years. Re-operations are performed every 48 hours for reassessing the peritoneal inflammary process until the abdomen is free of ongoing peritonitis; then the abdomen is closed. The advantages of the planned re-laparotomy approach are optimization of resource utilization and reduction of the potential risk for gastrointestinal fistulas and delayed hernias. The results of a clinical trial published in 2007 by Van Ruler et al. investigating the differences between on-demand and planned re-laparotomy strategies in patients with severe peritonitis found few advantages for the planned re-laparotomy strategy; however, the study mentioned that this later group exhibited a reduced need for additional re-laparotomies, decreased patient dependency on subsequent health care services, and decreased overall medical costs. An open abdomen (OA) procedure is the best way of implementing re-laparotomies. The role of the OA in the management of severe peritonitis has been a controversial issue. Although guidelines suggest not to routinely utilize the open abdomen approach for patients with severe intra-peritoneal contamination undergoing emergency laparotomy for intra-abdominal sepsis, OA has now been accepted as a strategy in treating physiologically deranged. patients with acute peritonitis. The OA concept is closely linked to damage control surgery (DCS), and may be easily adapted to patients with advanced sepsis and can incorporate the principles of the Surviving Sepsis Campaign. The term damage control surgery for trauma patients was introduced in 1993. It was defined as initial control of haemorrhage and contamination, allowing for resuscitation to normal physiology in the intensive care unit and subsequent definitive re-exploration. Similarly to the trauma patient with the lethal triad of acidosis, hypothermia and coagulopathy, many patients with sepsis or septic shock may present in a similar fashion. For those patients, DCS can truly be life saving. Patients progressing from sepsis through severe sepsis with organ dysfunction into septic shock, can present with vasodilation, hypotension, and myocardial depression, combined with coagulopathy. These patients are profoundly haemodynamically unstable and are clearly not optimal candidates for complex operative interventions. Abdominal closure should be temporary, and the patient is rapidly taken to the ICU for physiologic optimization. This includes optimization of volume resuscitation and mechanical ventilation, correction of coagulopathy and hypothermia, and monitoring for eventual ACS developement. Over the following 24 to 48 hours, when abnormal physiology is corrected the patient can be safely taken back to the operating room for re-operation. Following stabilization of the patient, the goal is the early and definitive closure of the abdomen, in order to reduce the complications associated with an open abdomen. Primary fascial closure can be achieved in many cases within few days from the initial operation. It would not be successful if early surgical source control failed. Sequential fascial closure could immediately be started once abdominal sepsis is well controlled. In these cases, surgeons should perform a progressive closure, where the abdomen is incrementally closed each time the patient undergoes a reoperation. Within 10 to 14 days the fascia retracts laterally and becomes adherent to the overlying fat; this makes primary closure impossible. Therefore, it is important to prevent the retraction of the myo-fascial unit. Several materials can be used to achieve temporary closure of the abdomen: gauze; mesh; impermeable self-adhesive membrane dressings, zippers and negative pressure wound therapy (NPWT) techniques. The surgical options for management of the OA are now more diverse and sophisticated, but there is a lack of prospective randomized controlled trials demonstrating the superiority of any particular method. At present, NPWT techniques have become the most extensively used methods for temporary abdominal wall closure. NPWT actively drains toxin or bacteria-rich intra peritoneal fluid and has resulted in a high rate of fascial and abdominal wall closure. Skin and soft tissue infections include a variety of pathological conditions involving the skin and underlying subcutaneous tissue, fascia, or muscle and ranging from simple superficial infections to severe necrotizing infections. Necrotizing soft tissue infections are potentially life-threatening infections of any layer of the soft tissue compartment associated with widespread necrosis and systemic toxicity. Source control for soft tissue infections includes drainage of infected fluids, debridement of infected soft tissues and removal of infected devices or foreign bodies. Skin and subcutaneous abscesses are typically well circumscribed and respond to incision and drainage. Necrotizing soft tissue infections always require surgical intervention including drainage and debridement of necrotic tissue in addition to antibiotic therapy. Delay in source control for patients with necrotizing soft tissue infections has been repeatedly associated with a greater mortality. In these patients removal of all non-viable tissue should be accomplished including muscle, fascial layers, subcutaneous tissue, and skin if they are compromised, and the incision should be extended until healthy viable tissue is seen. Planning a first re-exploration within 12–24h and repeating re-exploration(s) until the patient is free of necrosis should be always considered. The infection of medical devices like meshes are very insidious in clinical practices. The use of a mesh has become the standard in hernia repair surgery worldwide due to the reduced rates of recurrence and technical ease of the operation. However, mesh-related complications have become increasingly more frequent. Post-operative mesh infections are rare but troublesome complications that cause considerable morbidity and necessitate mostly mesh removal. Antibiotics and mesh-saving operations are not generally sufficient to eradicate the infection in the majority of cases. The pathogenesis of mesh infection is a complex process involving many factors including, but not limited to, bacterial virulence, surface physicochemical properties of the prosthetic material, and alterations in host defense mechanisms. Bacterial adherence and biofilm formation on the surface of synthetic materials are essential steps in the sequence leading to mesh infections. The first stage of mesh infection is bacterial adherence to the prosthesis. The result of adherence to hernia prosthetics is the formation of the bacterial biofilm. Biofilm produced by the bacteria have a pivotal role in mesh infection. Several studies have documented in vitro that multiple species of bacteria can attach to prosthetic mesh surfaces and form biofilm including coagulase-negative staphylococci, Stapylococcus aureus, Escherichia coli and Pseudomonas aeruginosa. Embedded in self-secreted extracellular polymeric substances, biofilm can provide bacteria an effective barrier against host immune cells and antibiotics. Biofilm has been documented in association with a wide variety of implanted materials, such as central venous catheters, urinary catheters, heart valves, orthopedic joint prostheses and internal fixation devices and also in non-absorbable meshes. The nature of biofilm structure makes micro-organisms difficult to eradicate and confer an inherent resistance to antimicrobial agents. Although, several studies have shown that in certain instances a conservative approach may be successful for salvaging a contaminated mesh, in most cases antibiotics and wound drainage are not sufficient to eradicate the infection. If conservative treatment fails, the complete surgical removal of the mesh is mandatory. Marshall JC. Principles of source control in the early management of sepsis. Curr Infect Dis Rep.2010;12(5):345–353. Marshall JC, al Naqbi A. Principles of source control in the management of sepsis. Crit Care Clin.2009;25(4):753–768. Holzheimer RG, Gathof B. Re-operation forcomplicated secondary peritonitis-how to identify patients at risk for persistent sepsis. Eur J Med Res. 2003;8(3):125–134. van Ruler O, Mahler CW, Boer KR, Reuland EA, Gooszen HG, Opmeer BC, et al. Comparison of on-demand vs planned relaparotomy strategy in patients with severe peritonitis: a randomized trial. JAMA. 2007;298:865–872. doi: 10.1001/jama.298.8.865. Demetriades D. Total management of the open abdomen. Int Wound J. 2012;9(Suppl 1):17–24. Sartelli M, Chichom-Mefire A, Labricciosa FM, Hardcastle T, Abu-Zidan FM,Adesunkanmi AK, et al. – The management of intra-abdominal infections from a global perspective: 2017 WSES guidelines for management of intra-abdominal infections. World J Emerg Surg. 2017 Jul 10;12:29. Sartelli M, Guirao X, Hardcastle TC, Kluger Y, Boermeester MA, Raşa K,et al. 2018 WSES/SIS-E consensus conference: recommendations for the management of skin and soft-tissue infections. World J Emerg Surg. 2018 Dec 14;13:58.